Have you ever wondered where pollinators go in winter? Most of us think of pollinators in spring and summer, when crops and wildflowers are in bloom and bees, wasps and butterflies are everywhere. Media coverage of pollinators peaks in spring months, and most studies of pollinator activity in crops and natural ecosystems are carried out during flowering in spring or summer, for obvious reasons. Pollinators don’t just miraculously disappear in autumn, to reappear again in spring like a floral fairy godmother. Some insects, like the monarch butterfly, migrate en masse to warmer climates as adults. Unlike bird migrations, insect migrations are a tag team affair – an adult travels to the summer house, reproduces, and the next generation returns to the ancestral home to reproduce and start the cycle again. 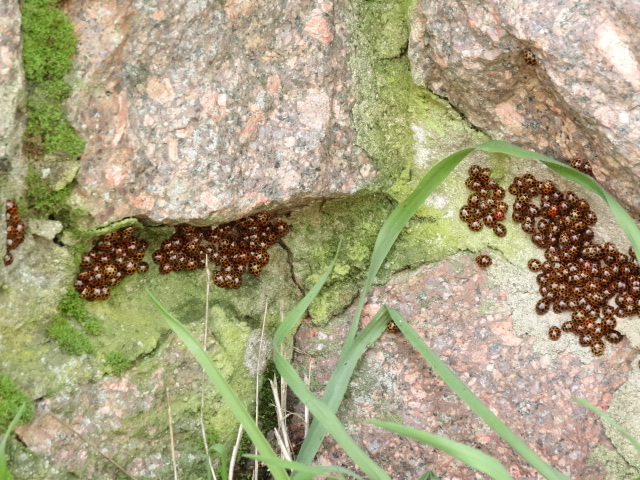 Ladybird beetles, on the other hand, are more into snow holidays. In temperate climates, many species migrate up to cooler alpine areas as adults, spending the winter in mass aggregations to keep warm. Still, some pollinators do stay put over winter, like some bees, flies and wasps. They are just hidden, overwintering in nest cells, or under leaf litter and bark shelters. If they overwinter as larvae, they will transform into an adult and emerge into the world in spring. If they overwinter as an adult, their activity levels will gradually increase as their environment warms. Why does this matter? Most pollinators don’t travel very long distances to forage. Although the European honey bee’s ability to fly a few kilometres in one go is often cited as generic fact, foraging distances for different pollinators are highly variable and depend on resources and disturbances in the greater landscape. Most smaller solitary bees only travel a few hundred metres, while flies and larger wasps can travel a bit further. If there are no resources in the surrounding landscape, they won’t travel there, no matter how close it is. So, pollinators may only travel a few hundred metres from where they emerge from a nest cell or overwintering site. Therefore, it makes sense that if you want pollinators to hang around your patch of land, you might want to think about what overwintering resources are available on and around that patch of land. If there are very few different types of resources, fewer pollinators will nest or overwinter there, which could affect the diversity and abundance of the pollinators that are around the following spring. This is especially important for agroecosystems, especially in crops that rely on pollinators for yields. Pollinator-dependent crops that flower in late winter, like almond, create a double challenge. Not only do these systems want to ensure that pollinators will emerge on site every spring to pollinate the crops, a lack of suitable nesting resources can affect the long-term structure of pollinator communities in the region. However, very few studies have looked at the potential for agroecosystems to provide overwintering resources, and few crop pollinator management strategies consider the importance of overwintering resources in maintaining permanent pollinator communities in crop systems. As a follow-up to my previous investigation of whether mallee/almond edges influenced wild pollinators, we looked at how overwintering resources changed across the ecotone between the two habitats, as well as across time – before (July), during (August) and after (September) the brief almond flowering event. We then looked at whether these resources influenced pollinator abundance and family richness. Fly abundance and wasp abundance and richness showed strong associations with overwintering substrates (leaf litter or ground cover vegetation) before almond trees bloomed, when temperatures were colder, but no associations with these resources in spring, after almond flowering ceased. We didn’t catch any bees in July or August, because they are a bit more sensitive to cooler temperatures than flies and wasps. In contrast to wasps and flies, native bee abundance in September was strongly associated with a lack of leaf litter and ground cover. Why? Very little research has been done on mallee bees, but knowledge of bee species from other Mediterranean or semi-arid ecosystems tells us that similar bee species prefer to excavate nests in bare soil. So why aren’t there more of these bees in the almond plantations, where there is an oversupply of bare soil? 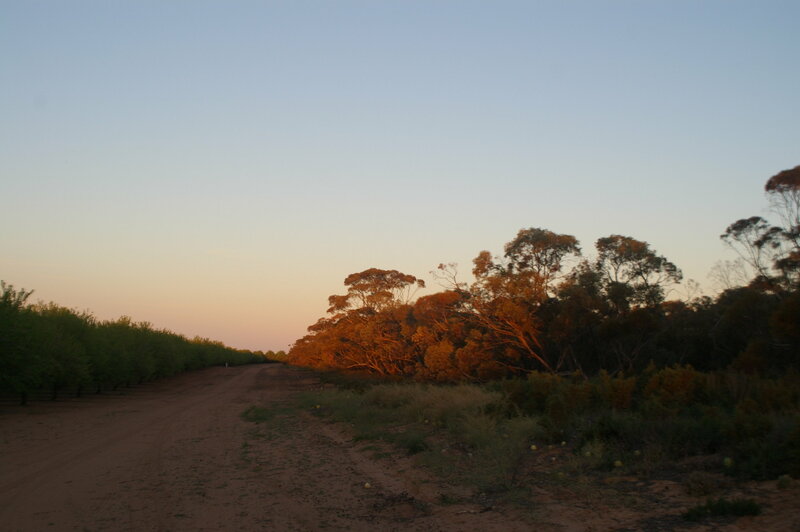 Because they also prefer open, sunny areas, and plantations are not open – canopy cover was an average of 58% compared to 26% at mallee sites. Bees also need diverse food resources, and the monoculture almond plantations stopped providing any bee food after they ceased flowering. So if you’re planning pollinator habitat, or interested in knowing what wild pollinator communities are available to a particular crop, it could help to think about what pollinator species will need over winter. A lack of nesting sites or overwintering shelters available for different pollinators in a particular patch of land may influence what pollinators you see in spring at that location.